Allies, opponents, and mysterious strangers all gather in the tavern, where the rumors flow as easily as the ale. 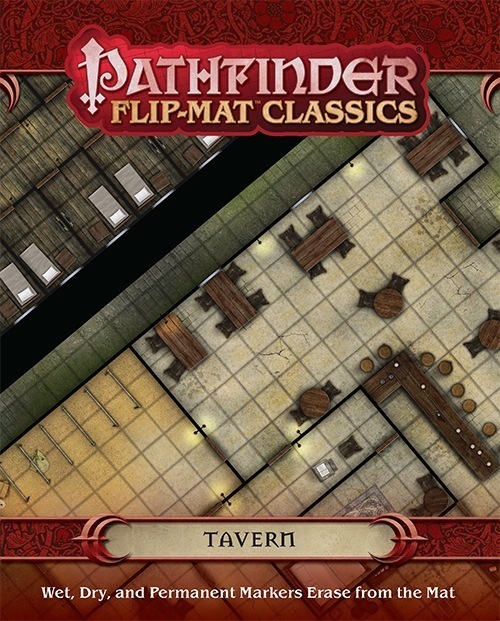 Whether your players are on the trail of a dirty thief or just looking for a fight, Flip-Mat Classics: Tavern is a perfect setting for any adventure! Need More Room? Check out Pathfinder Flip-Mat: Bigger Tavern, which gives you 45% more gaming space than the standard Pathfinder Flip-Mat! 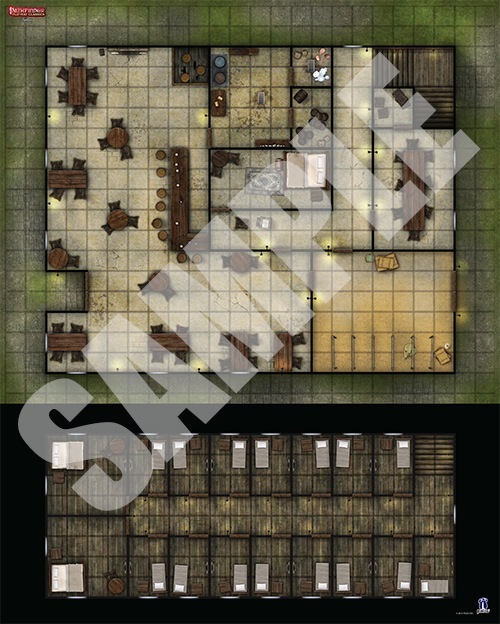 The first side provides what I think is the most useful of the various tavern maps, although I would call this an inn since it also has rooms for sleeping. It's generic enough that you could use it pretty much anywhere. It has a good sized main room with plenty of tables and chairs that provide some interesting tactical obstacles without excessively gumming things up. The backrooms provide additional chokepoints or areas where defenders can retreat. The second level of the tavern is conveniently located on the same side, so your battle can be raging on both levels simultaneously. Even with both levels on one side, there's plenty of room for combat. Now, the not-so-impressive aspect is the second side. Providing a completely generic, open, grassy battle map is, to my mind, a complete cop out. It has absolutely nothing to do with the inn and shows a real lack of imagination. How about providing additional levels to the inn, such as an attic or cellar? Perhaps stables for travelers? No, just a grassy field. As much as I like the first side, I can only give this 4 stars due to the complete cop out on the second side. Still, given how good the tavern is, I imagine it will get a lot of use. <a main room with 11 tables of different sizes with 36 chairs and a bar with 8 stools, a kitchen with 2 storage rooms, a backdoor with a lit corridor that leads to a backroom, a stair to the upper floor and the owners room and a stable. The upper floor has 15 single bedrooms and 2 double bedrooms. 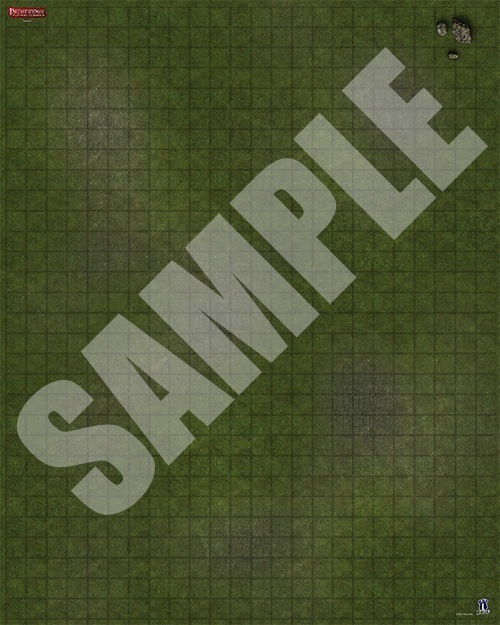 On the flip side you get a grassy plain for battles in the wilderness or when you don´t want to buy the "Basic Terrain Multi Pack". Are... are you reprinting the original Flip-Mats? Just eight selected maps that sold well enough—and have been out of print long enough—that we think will sell enough to justify it. Well, I'll certainly try to do my part to make sure they sell well enough to be justified. Updated with final product description. Just noticed these (that'll teach me to hang out in Rules Questions, Third-Party Products and Off Topic). I am simultaneously thrilled to see these back in print (they will be mine, oh yes, they will be mine...) and heinously chagrined that I don't have the pennies today. I shall plot. And scheme. I'm glad to see this one come back, but I am also wondering why the opportunity hasn't been taken to put a second map on the back. Because then it wouldn't be a reprint—it'd be new enough to annoy people that have the old one. I like it but with a map on only one side I will pass. My markers weep in joy of not having to detail this room. Same here. I won't be buying any one sided flip maps. They aren't making these better because they don't want to upset people who bought the one sided map? Where's the progress in that? If Paizo is going to remake something, then make it better. That's like saying they won't correct errata in their books because the first print owners would be offended. It's a backwards mentality. Paizo should ALWAYS look for ways to up their game. That's how they'll keep customers loyal. That’s a completely inaccurate comparison with the errata. With errata, the original is a ‘mistake’ and is now being corrected. With the flip-mats, the original is just fine and nothing needs to be corrected. The reprint is just that, a reprint. And yes, not wanting to offend original buyers is a legitimate action. Why should they have to buy the new flip-mat to get the other building if this is a ‘re-print’ of the original? If that happens, then it is no longer a re-print but a new flip-mat. If you don’t feel the tavern side is something you don’t use, that’s fine, I agree with you in not buying the flip-mat. But don’t accuse Paizo of being a ‘non-progress’ company because they don’t change the flip-mat to buildings on both sides. I think if you asked most here they would agree Paizo truly has progressed as a company and continues to do so.Also, Paizo didn’t have to reprint any of these flip-mats. This is something they are doing because many customers have asked to get access to some of the more popular maps that are now out of print. So in giving the customers what they asked for, wouldn’t you consider that progress? And this comes from somebody who does NOT have the original flip-mat. I'm trying to get a full set of Flip-Mats - a different printing is fine, but a functional difference might bother me.